While I love my current Bible, it is falling apart in places and I’ve been needing to find a replacement. 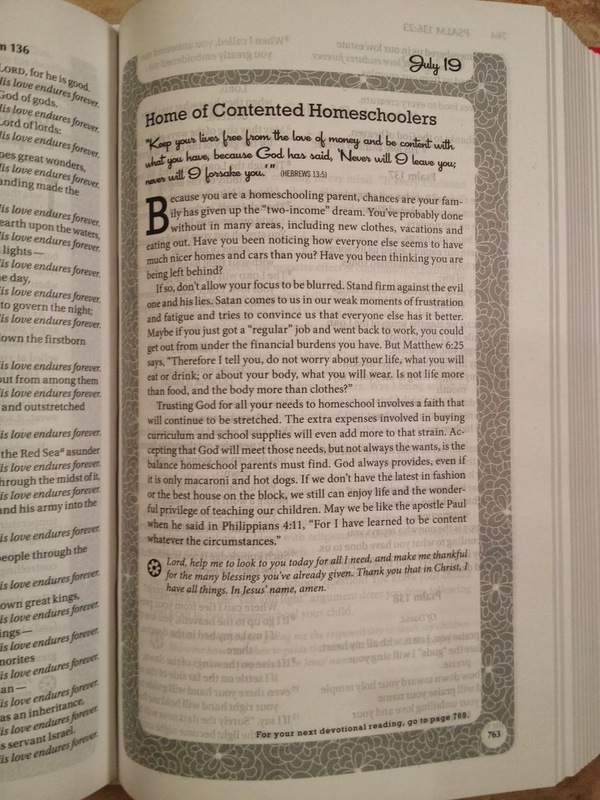 So I was excited to review the Homeschool Mom’s Bible! Zondervan is a Christian publishing company that aspires to make God’s truth known. Their goal is to provide God-honoring resources to Christians in order to serve people and honor God. They are the publishers of the new Homeschool Mom’s Bible. This book contains 365 daily devotions written by homeschooling mom, Janet Tatman, for other homeschool moms. The devotions were written to encourage, inspire, convict, and challenge the homeschool mom in her daily journey to walk with Christ, care for her family, and teach and disciple her children. The Bible retails for $34.99 for the hardcover book. You can choose either the NIV version or the KJV Bible. I used this Bible as a devotional. I simple paged through the book to find each devotion and I read several each day to find encouragement and a refreshed perspective on our homeschool journey. I also found the topical index in the back of the Bible to be very helpful. When I was having a difficult day or struggling with something in particular, I used the index to find relevant devotions for that day (such as for weariness or procrastination). In this devotion the author talks about a time when her son was bored and complained about having nothing to do. She decided that this was a prime opportunity to teach her son a Biblical truth. She explained how 80% of life is ordinary and only a small 20% of life experiences will be extraordinary. But that God wants you to be faithful in the ordinary as well as the extraordinary. She mentioned several figures who lived many years in a “normal” and maybe even boring life such as Mary before she became the mother of Christ or Joseph until he became one of the leaders of Egypt. The author then encouraged the reader to reflect on life and think of the times when God was served in the ordinary moments. This is the preparation to serve God in the extraordinary times. This devotion really resonated with my heart. I struggle with serving during the ordinary times. My life although very very busy, can seem somewhat ordinary and unexciting. I get up each day, make 3 meals a day for my kids, teach them, read with them, change diapers, and diffuse arguments. I sometimes feel like what I’m doing isn’t worthwhile or valuable. I feel that my life can be downright boring and monotonous. But I was so encouraged to continue to serve God in the ordinary times to better prepare myself for fully serving Him in extraordinary ways. As a mom of many little people who often feels weary and insignificant, I needed this reminder! 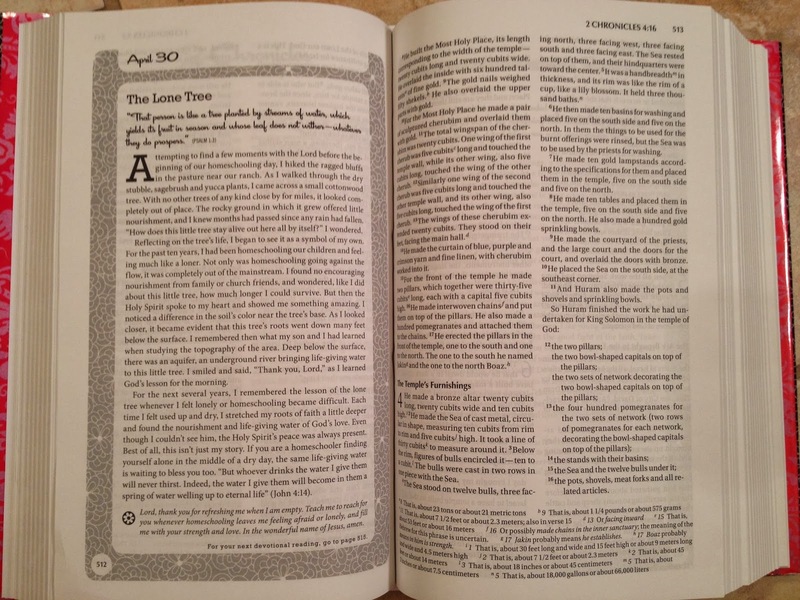 This Bible is not a study Bible and does not contain any extra notes. There are no detailed footnotes or even short introductions to each book of the Bible. While I wasn’t looking for an indepth study Bible, I still like my regular Bible to have some helpful notes throughout. I was disappointed that this Bible had none of those. The devotions are scattered throughout the Bible but do not line up to the Scriptures on the surrounding pages. You would be reading in the book of Job and the devotion would reference verses in Hebrews and Psalms. One of the devotions in the book of Jonah was from Colossians. A devotion in Galatians was from Psalms and one of the devotions in Titus reference Ecclesiastes. If I could describe this Bible and the devotions in one word, I would use “random.” The devotions did not in any way relate to the nearby verses and were just placed throughout the Bible in no apparent order. I don’t know about you, but if I’m reading a passage in Luke about Christ’s birth I do not want to read a devotion about if I was dressed for success for my homeschool day and if I had the right intentions. As another example, there is a devotion that references Joseph and it is placed in the book of Deuteronomy in a chapter where Joshua and Moses are mentioned. I was highly disappointed that the devotions did not relate to the surrounding Scriptures and did not fit the context of the verses. In the back of the Bible is a topical index that lists the Biblical figures or the character qualities addressed in the devotions so you can quickly look up any topic. The index lists all the pages of the devotions which address that topic. 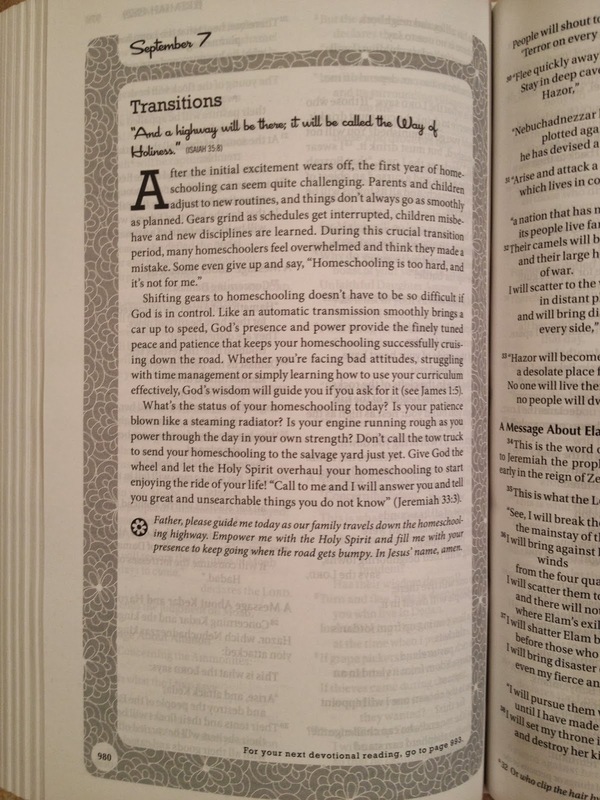 The devotions were written by a woman who definitely knows the heart of the homeschool mom. Her devotions spoke to my heart and rang true. I found them encouraging and convicting. They challenged me to make some changes in our homeschool and they gave me hope in areas where I was feeling greatly discouraged. I loved reading them and I loved the way she related each topic to a various Scripture reference. I loved the devotions in this Bible. 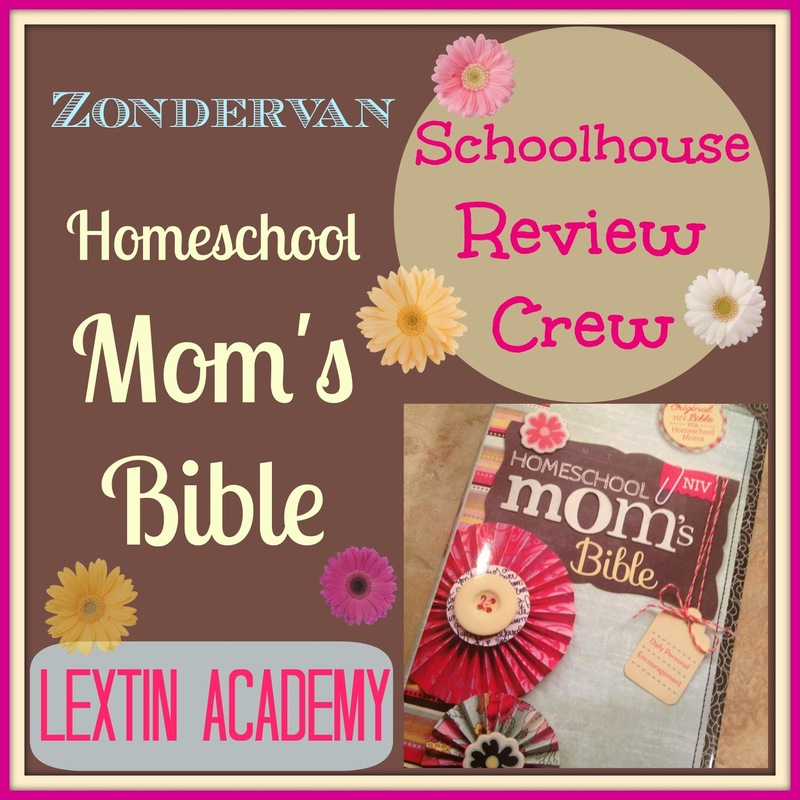 They are well-written and hit home with this homeschool mom. I found myself nodding in agreement with them, laughing at the truthfulness, and crying as some spoke deeply to my heart. The Bible itself, while very pretty on the outside, was nothing out of the ordinary and I was rather disappointed in its simplicity and lack of extra information. I was most disappointed by the organization of the devotions throughout the Bible. They were placed randomly throughout the Bible – devotions in the Old Testament referenced New Testament Scriptures and vice versa. I found this to be very distracting when I was reading through the Bible and came to a devotion. Overall, I would have preferred the devotions to be in a stand alone book. I found myself reading the Bible only for the devotions while using another Bible for my Bible study time. I think the devotions are very worthwhile; however, I would have found them easier to read and use if they were just contained in their own book. Read the rest of the Crew Reviews here! ← New Giveaway Coming Soon! Thank you! I'm still working on my review, but this was exactly my reaction too! I'm glad someone else felt that way. I'd better got finish writing mine up!